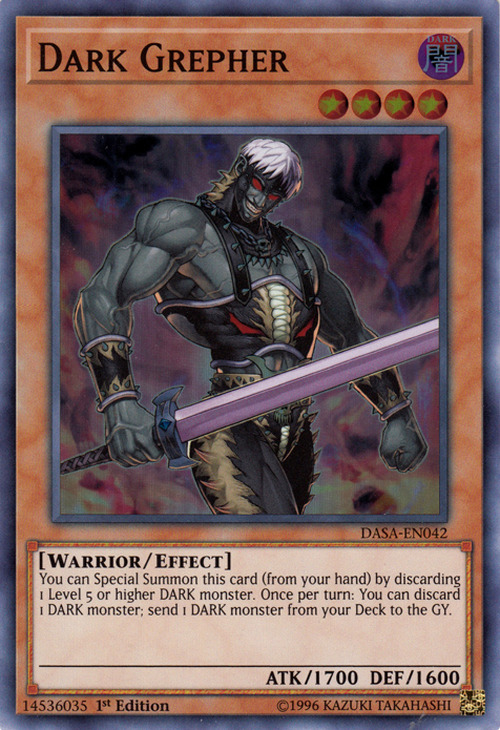 This card is the Dark counterpart of Warrior Dai Grepher. This monster appears in the artworks of Darklight, Painful Return, Rivals Unite. Promotional pictures of this card originally listed it as a Beast-Type, even after it was confirmed to be a Warrior-Type. This monster was the Sneak Preview Participation Card for Phantom Darkness. Discarding 1 Level 5+ DARK monster is a cost to Special Summon this card from your hand. Discarding 1 Level 5 or higher DARK monster to Special Summon "Dark Grepher" is a cost. Discarding 1 DARK monster for "Dark Grepher's" second effect is a cost.